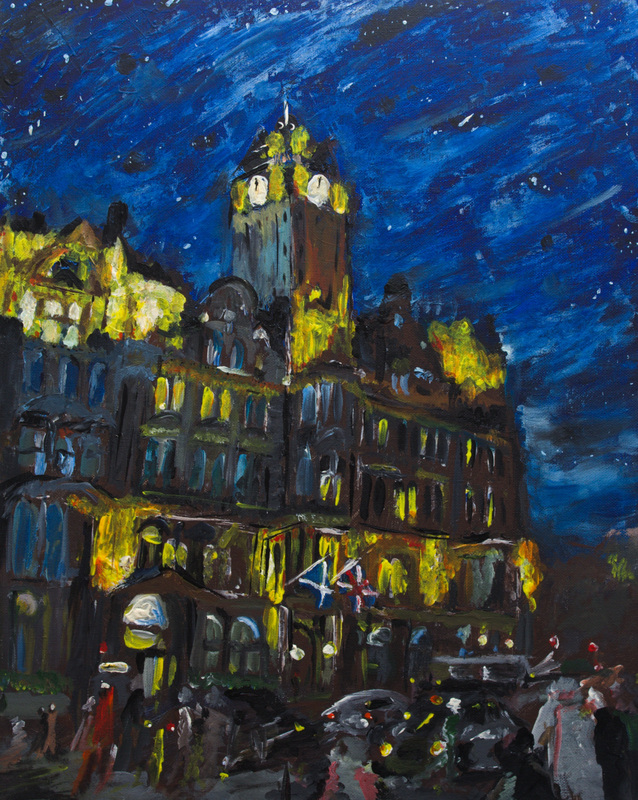 This month’s featured artwork is Midnight at the Balmoral. This painting is rather special to me because it’s the first completed painting I have made in well over 10 years and represents the start of my return to art as a serious and active part of my life. My interest in art, particularly the disciplines of drawing and painting began from a very young age. At primary school, art was something that I had a natural affinity with over other things, particularly any sport. I think it’s fair to say I was an indoors sort of child. It’s difficult for me to say how it all began, but my earliest memories relate to drawing and painting. I remember when I was young, I think when I was 7, being asked by my dad what I wanted to be when I grew up and I answered “I want to be an artist”. I particularly remember sitting engrossed in front of the TV after school watching Bob Ross’ “The Joy of Painting” on the Discovery Channel whose calm demeanour and techniques I attempted to emulate later on. This is now on Netflix and I feel my childhood has come full circle! Throughout my early teens, my interest in art diverted to Japanese styles of drawing particularly anime and manga which is unsurprising as an explosion of Japanese anime crossed over to UK TV channels and flooded my life from Pokemon, Digimon, Yu-Gi-Oh, Dragonball Z, Spirited Away, Sailor Moon, Cardcaptors, etc. The kaleidoscope of colours, action and characters embedded in my mind and took hold. Although I remember learning about the basic proportions of anatomical drawing in primary school, it was manga where I learnt to draw the figure. I would copy my favourite characters from games and TV, onto paper. Although highly stylised, this was excellent practice in drawing the figure and trying to get the proportions of the body established in my mind. As time passed in school I remember my GCSE Art and Design being particularly stressful and I think that was where my interest in art started to wane. Over that 2 year period, I remember feeling frustrated that the paintings I was producing weren’t good enough and that the process was difficult and tiring. I had lost direction and this resulted in a real loss of confidence in my own ability and at that point I associated art with stress. This negative association held firmly in my mind regrettably, for many years and I abandoned it. It was also at this point that I started to focus my mind on medicine and from here on in my priorities shifted to my career proceeding from medical school and now orthopaedic training. Art was still a satellite presence during these moments. I occasionally attended life drawing classes to refresh my mind and retain that essence but it was always a back seat to career advancement. I always created excuses in my mind not to do it “It won’t help your career”, “it’s a distraction”, “it’s a hobby nothing more”, “focus on your exams”, “focus on your applications”, “do this project and this project” etc. etc. At medical school, an opportunity to reinvigorate my artistic brain presented itself: organising and designing the sets, costumes and props with others for a musical. I remember enjoying that process immensely but even after that process was complete, the dissenting voices put me off returning to art for the sake of other things. In 2016 I had reached a moment of reflection. I had in my mind worked hard for many years to reach a certain point in my medical career which I had attained. My housemate at the time also painted and I happened to be on a plastic surgery rotation and I discovered others who had an interest in art. I decided to buy a cheap set of acrylic paints, a canvas and picked up old brushes that I had carried with me from flat-to-flat, unused and I decided I wanted to paint something. I wanted to paint something because that’s what I wanted to do over anything else at that moment in time. I had no idea how it would turn out. It may not be great, or it might look all right. I decided a night scene might be a good idea. Try to emulate Van Gogh, I thought, and channel that. 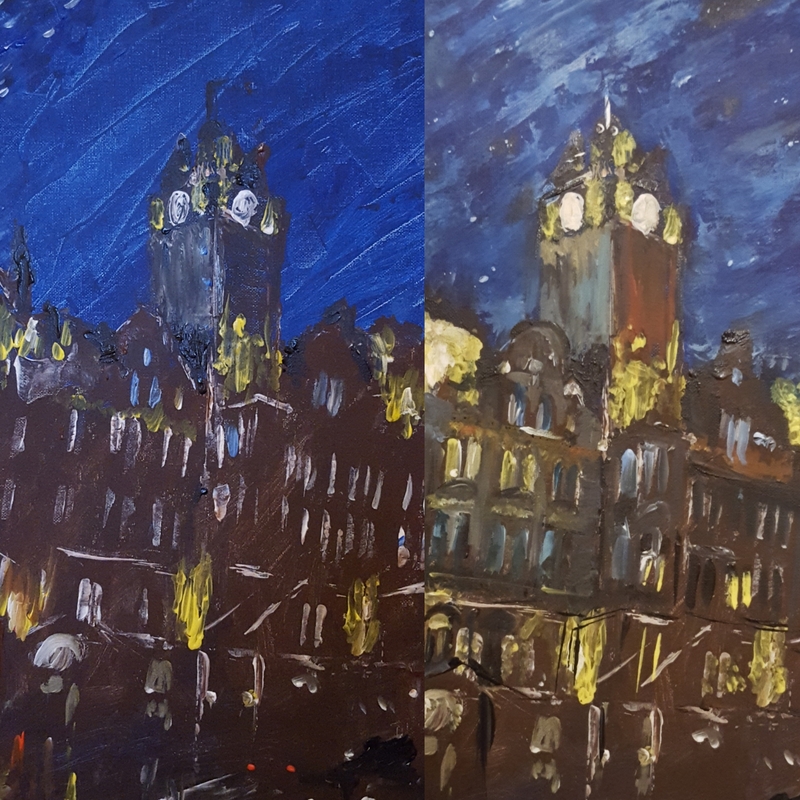 I found a photo I took of the Balmoral on my phone at night and I started painting. I laid down some Prussian blue followed by some burnt umber and thought “Hmmm. This is rather dark”. The building proportions didn’t look right. Everything was too dark. I had fallen into the trap of being too critical too early. At that moment I decided to ignore those voices and keep persisting. Keep going until the end product was something I wanted in my mind. I picked up the palette knife with some white and made bold diagonal movements in the sky. I suddenly created clouds. I entered a small frenzy whereby I cast random dots to make stars and paint the lights of the hotel in the brightest yellow. The dark brown helped accentuate these highlights and a gleaming hotel in the rain was staring at me in the face. It was a tremendous feeling. Images of the process of painting. Errors were made along the way, but instead of instantly turning to criticism I converted that to analysis. Instead of thinking “this looks rubbish”, I thought “right what elements are working and what elements need changed”. If something wasn’t quite right I’d wait a bit and paint something else and see if it worked. By actively choosing to ignore the dominant negative voices I was able to just keep going and see what would happen. This was difficult but I felt a long dormant part of me had awoken at that point. For me this painting represents a voice, that for a very long time was silenced by more dominant louder and more negative voices in my mind. Voices telling me to do things for this sake or that. Voices that told me to do what was expected of me rather than what I wanted to do. Negative voices in my head that stated that art and painting was frivolous, or undeserving and unworthy of my time. I had prioritised other things that were time consuming that gave me relatively little joy. For me, art is a gift and a craft that was, for many years, practiced and honed before almost being suppressed forever. It is rusty around the edges but I’m enjoying the learning process that comes with every painting and producing work that not only brings me joy, but brings others joy as well. My 7-year old self was right. As a grown-up, I became an artist.